Yolk sac tumors are those that resembles the yolk sac, allantois, and extraembryonic mesenchyme. They are also known as endodermal sinus tumors. Yolk sac tumors (YSTs) can be seen in males and females, involving the testis, ovary, and other sites, such as the mediastinum. Yolk sac tumors (YSTs) of the testis are observed in 2 forms or age groups: pure YST in young children and mixed type in adults. In children, yolk sac tumors (YSTs) are more common in Asians than in white or black persons. In adults, these tumors are more common in white individuals than in other races. The etiology of yolk sac tumors (YSTs) is essentially unknown. It is speculated that hypermethylation of the RUNX3 gene promoter and overexpression of GATA-4, a transcription factor that regulates differentiation and function of yolk sac endoderm, may play important roles in the pathogenesis of yolk sac tumors (YSTs). [3, 4] However, these hypotheses have not been validated. Yolk sac tumors (YSTs) of the testis are located in the testis parenchyma. Children with yolk sac tumors (YSTs) usually present with painless testicular masses, which are typically bulky lesions. Metastasis is uncommon at presentation, occurring in less than 10% of cases. In adults, yolk sac tumors (YSTs) are associated with other germ cell components such as embryonal carcinoma, choriocarcinoma, teratoma, and seminoma as a part of a mixed germ cell tumor. No specific symptoms except testicular mass are present. Almost all the patients with a yolk sac tumor (YST), either in pure form or mixed form have a significantly elevated serum alpha fetoprotein (AFP). The presence of hair, bone, or cartilage (the elements of a teratoma) can be seen in a testicular mass in adults by radiographic examination, which may or may not be associated with yolk sac tumor (YST) components. The radiographic findings are specific for malignant mixed germ cell tumors but are not specific for yolk sac tumors (YSTs). Grossly, yolk sac tumors (YSTs) are solid gray-white with a gelatinous, myxoid, or mucoid appearance. Necrosis, cystic changes, and hemorrhage are often seen. In adults, the gelatinous appearance of these tumors is mingled with the gross findings of the other germ cell tumor components; therefore, the overall appearance of a yolk sac tumor (YST) is heterogeneous. 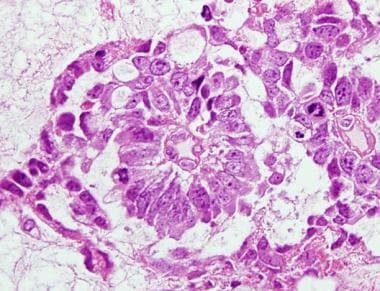 Yolk sac tumor (YST) of the testis is composed of primitive tumor cells, which are relatively small and less pleomorphic relative to those in embryonal carcinoma, another common subtype of malignant germ cell tumor of the testis. YST cells may form many histologic patterns resembling embryonal structures. The most common pattern seen in the majority cases of these tumors is microcystic structure, which is characterized by the presence of a spider-weblike network formed by vacuolated cytoplasm of tumor cells, similar to a honeycomb (see the image below). Microcystic pattern of yolk sac tumors. The tumor cells form a network connected by cytoplasm. The endodermal sinus pattern consists of a central vessel rimmed by fibrous tissue, surrounded by malignant epithelial cells in a cystic space which is lined by flattened tumor cells. This endodermal sinuslike structure is called a Schiller-Duvall body and is pathognomonic of yolk sac tumors (YSTs) (see the following image); however, Schiller-Duvall bodies are present only in 50-75% of these tumors. Schiller-Duvall body. A Schiller-Duvall body is a structure resembling the endodermal sinus, characterized by the presence of a central vessel, surrounded by fibrous tissue and epithelial tumor cells, in a space lined by flat tumor cells. Hyaline globules ranging from 1 to 50 microns can be seen in yolk sac tumors (YSTs), which are periodic acid-Schiff stain (PAS) positive and diastase-resistant. Occasionally, the hyaline globules can be positive for AFP. Eosinophilic bands (extracellular basement membrane material) are frequent findings in yolk sac tumors (YSTs). Either hyaline globules or eosinophilic bands are specific for these tumors. 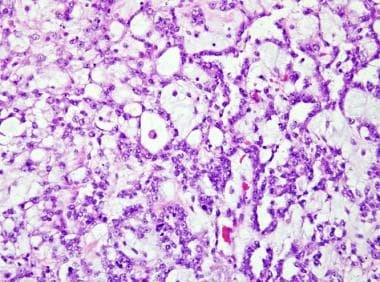 Yolk sac tumor (YST) cells are positive for AFP, which can be detected on tissue sections as well as in the serum of the patients with these tumors. However, AFP is not specific for yolk sac tumors (YSTs), as other tumors such as hepatocellular carcinoma and hepatoblastoma can also be positive for APF. Cytokeratin is present in almost all the cases, and vimentin can be positive in spindle cell patterns. Approximately 40-80% of cases of yolk sac tumors (YSTs) are positive for placental alkaline phosphatase (PLAP), a marker of several different subtypes of germ cell tumors. The loss of the short arm of chromosome 1 (1p36) and the long arm of chromosome 6 (6q) as well as gain of the long arm of chromosomes 1 and 20 have been reported in yolk sac tumors (YSTs). In addition, isochromosome 12p, which is characteristic of other malignant testicular germ cell tumors, can be detected. Of children with yolk sac tumors (YSTs), 80-90% of the tumors are stage I disease. The presence of a yolk sac tumor (YST) component in stage I tumors has been associated with decreased likelihood of occult metastasis. Without treatment, this tumor is highly aggressive in children and will lead to death. With a combination of modern surgical treatment and adjuvant chemotherapy (cisplatin-based), the survival rate in those with yolk sac tumors (YSTs) is greater than 90%. The prognosis of a malignant germ cell tumor in adults with a YST component is dependent on the response of the YST as well as other components to therapy. Age at diagnosis is not a predictive factor in yolk sac tumors (YSTs), but the degree of AFP elevation, in addition to other serum tumor markers in mixed germ cell tumors, has been shown to correlate with prognosis. For serum AFP, levels < 1000 ng/mL are in the good prognostic category, levels >10,000 ng/mL are in the poor prognostic category, and those in between these levels are associated with an intermediate prognosis. Stage is also an important prognostic factor; early detection of lower stage disease will result in better prognosis . Embryonal carcinoma (EC) should be distinguished from yolk sac tumors (YSTs), because EC is more pleomorphic, and lacks the special patterns of YST. Seminoma should be distinguished from the solid pattern of yolk sac tumors (YSTs). Seminoma cells are bigger that YST cells, with lymphocytic infiltrates. Juvenile granulosa cell tumor (JGCT) should be distinguished from yolk sac tumors (YSTs) because of their morphologic similarities. JGCT is seen female children younger than 5 months old. Although microcystic patterns can be seen in JGCT, the other patterns of YST cannot be found in JGCT. Young RH, Scully RE. Testicular Tumors. Chicago, Ill: ASCP Press; 1990. 38-40. Talerman A. Endodermal sinus (yolk sac) tumor elements in testicular germ-cell tumors in adults: comparison of prospective and retrospective studies. Cancer. 1980 Sep 1. 46(5):1213-7. [Medline]. Kato N, Tamura G, Fukase M, Shibuya H, Motoyama T. Hypermethylation of the RUNX3 gene promoter in testicular yolk sac tumor of infants. Am J Pathol. 2003 Aug. 163(2):387-91. [Medline]. [Full Text]. Siltanen S, Anttonen M, Heikkila P, et al. Transcription factor GATA-4 is expressed in pediatric yolk sac tumors. Am J Pathol. 1999 Dec. 155(6):1823-9. [Medline]. [Full Text]. Li Y, Zheng Y, Lin J, Xu G, Cai A, Chen R, et al. Radiological-pathological correlation of yolk sac tumor in 20 patients. Acta Radiol. 2014 Dec 9. [Medline]. Grigor KM, Detre SI, Kohn J, Neville AM. Serum alpha1-foetoprotein levels in 153 male patients with germ cell tumours. Br J Cancer. 1977 Jan. 35(1):52-8. [Medline]. [Full Text]. Eglen DE, Ulbright TM. The differential diagnosis of yolk sac tumor and seminoma. Usefulness of cytokeratin, alpha-fetoprotein, and alpha-1-antitrypsin immunoperoxidase reactions. Am J Clin Pathol. 1987 Sep. 88(3):328-32. [Medline]. Zynger DL, Dimov ND, Luan C, Teh BT, Yang XJ. Glypican 3: a novel marker in testicular germ cell tumors. Am J Surg Pathol. 2006 Dec. 30(12):1570-5. [Medline]. Sugimura J, Foster RS, Cummings OW, et al. Gene expression profiling of early- and late-relapse nonseminomatous germ cell tumor and primitive neuroectodermal tumor of the testis. Clin Cancer Res. 2004 Apr 1. 10(7):2368-78. [Medline].